The California lease agreements allow a landlord of residential or commercial property to write a legally binding contract with a tenant. The agreement will describe the property, specify the monthly rent, and list any other terms or conditions of the parties. After signing and payment 1st month’s rent, along with any security deposit, the tenant will be given access and allowed to move-in on the start date. Rental Application – Should be used by the lessor before signing a contract to help verify that the individual applying for the space is credible. Commercial Lease Agreement – For the use of any business by an individual or entity with an owner of office, retail, or industrial property. Lease with Option to Purchase (Lease to Own) – Traditionally a fixed term contract with the added benefit of being able to buy the residence during a stated “option” period. Month to Month Lease Agreement (Laws in Section 1946)- Arrangement that is perpetual unless either the landlord or tenant decide to cancel or change. Termination of the agreement may only be administered with notice of at least thirty (30) days. If the tenant has lived on the property for more than one (1) year then sixty days’ notice is required. Room Rental (Roommate) Agreement – For a residence with more than one (1) individual seeking to separately occupy bedrooms while sharing common areas. Standard Lease Agreement – Most common type of residential lease for an established term, usually one (1) year, and both parties are bound to the terms until it’s end date. Sublease Agreement – A tenant that decides to rent space they are currently involved in a lease with the landlord. Usually, the tenant must receive written confirmation before authorizing a sub-lessee. 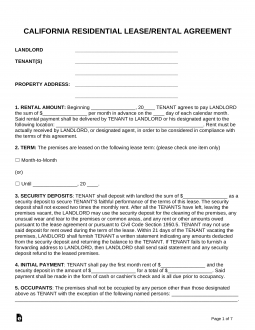 Termination Lease Letters – Mainly for month-to-month renters and landlords in order to cancel the contract and create an end date. Access (§ 1954) – Landlord must grant at least twenty-four (24) hours notice to the tenant prior to entry for maintenance or non-emergency. Forty-eight (48) hours is necessary if the access is for the move-out inspection. Bedbug Addendum (§ 1942.5(a)(1)) – Landlord acknowledges that there is prior no existence of bedbugs before move-in by the tenant in addition to the tenant confirming that their furniture does not contain the insect. Demolition (§ 1940.6) – If the landlord has received any type of permit from their respective municipal office to demolish a residential unit it must be disclosed to the tenant before accepting a rental contract or deposit. Flood Disclosure (PDF, MS Word, ODT) (§ 8589.45) – Mandatory as of July 1, 2018. The lessor is required to inform the tenant if the property is located in any special flood area. Landlord’s Default (§ 2924.85) – If the landlord is in default at the time or before authorizing a lease this information must be conveyed to the lessee before the time of signing. Lead-Based Paint – For any housing type built prior to 1978 to notify the habitants of the unit that the hazardous material of lead paint may exist in the under-layers of paint in their walls/ceilings. Megan’s Law (§ 2079.10a) – This Notice Statement is required to be in every residential contract. Mold Disclosure (§ 26147-26148) – Landlord must disclose to the tenant the health risks to mold by attaching the document to the agreement. Ordinance Locations (§ 1940.7(b)) – The landlord of a residential dwelling unit who has actual knowledge of any former federal or state ordinance locations in the neighborhood area shall give written notice to a prospective tenant of that knowledge prior to the execution of a rental agreement. Pest Control (§ 1099) – If any remediation has been conducted on the property any inspection report provided by the pest control company must be also forwarded to the tenant. Shared Utilities (§ 1940.9) – If the unit has a shared electrical or gas meter the agreement must state how the utilities shall be split between the parties. Smoking Policy (§ 1947.5) – Landlord must state if smoking is tolerated, the areas for which it is allowed including any and all common areas. Use the Smoking Policy Template. Asbestos Addendum – For the existence of this substance in a property. Carbon Monoxide Detector Compliance Form (§ 17926.1) – Landlord is required to have carbon monoxide monitors throughout all living units that have fossil-fuel based heaters and/or appliances. CC&Rs Addendum – Acknowledgment of declaration of covenants, conditions, and restrictions and association rules and regulations. Grilling Guidelines – Sets the rules for the tenant if the use of a grill is allowed. Move-In/Move-Out Inspection Checklist – To list any damage prior to move-in before the lease commencement and at it’s so the parties may see any added damage/repairs to the property. Most commonly the damage (if any) will be reflected in the tenant’s security deposit when returned by the landlord. Personal Guarantee – Gets an individual’s promise to pay for a written rental contract. Typically used when the tenant is high-risk and this form is designated for a creditable co-signer. Pet Agreement (PDF | Word) – If the tenant has a pet and would like to have on the landlord’s property. Pool & Hot Tub Addendum – For the use of a jacuzzi and/or pool on the premises. Renter’s Insurance Addendum – If the landlord requires the tenant to have liability insurance. Resident Policies and House Rules – Sets standard rules and parameters for the tenant to follow. Satellite Dish Addendum – All lessee’s in the State of California have the right to install a satellite dish on the property if they wish as long as it conforms to all local and State laws. Unlawful Activities Addendum – Tenant, or their guest, may not conduct any of the activities listed in the document or else will be considered criminal and immediate removal (eviction) from the property. *If you could not find your desired disclosure form check the Apartment Association of California’s Index Page. Maximum (§ 1950.5) – If furnished three (3) months’ rent. If unfurnished two (2) months’ rent. Returning (§ 1950.5) – Landlord shall return any and all deposits within twenty-one (21) days from the time the tenant moved out of the property. Any deductions should be listed in an itemized statement.